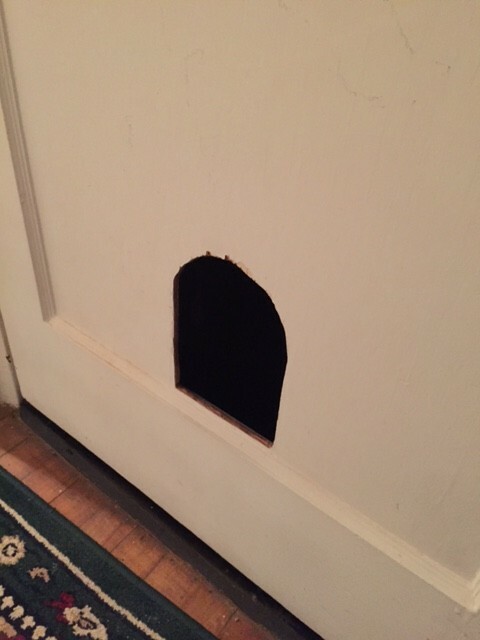 Last weekend I set out on one of my first do-it-yourself house jobs: cutting a hole in the basement door so the cats can easily go downstairs. Having just moved from a small apartment in Brooklyn, this was one of my first solo DIY jobs. As I took the basement door off its hinges, and carried it to the work area in the garage I was excited to test my prowess as a new homeowner. I looked around the house for tools to help do the job. I grabbed my drill, a large old-fashioned handsaw, and my jeweler’s saw. Using a pencil I drew an arching shape on the back of the door (the kind of shape you’d see on the wall in a Tom and Jerry cartoon). Drilling the first hole in the top of the arch I immediately realized two things. There was no way the handsaw was going to fit in the small hole I drilled in the door; it was an order-of-magnitude too big. The millimeter-wide blade of the jeweler’s saw would easily fit through the drilled hole, but the shallow depth of the jeweler’s saw-frame also made this tool useless for the job. Here I was in the garage with a door, a mission, and the wrong tools. I sat down on a step stool for a moment to contemplate my situation. As I was thinking, something interesting struck me. Trying to saw a hole in the door was a lot like trying to solve a technology product problem at work. The hole in the door was the product I needed to build, and the drill and saws were the decision-making tools used to come to the right decision on how to correctly design the product. When solving any complex product problem, having the right decision making framework is absolutely essential. There are all sorts of tools to help with this. There’s the SAFE framework, there’s the ethics based approach, there are all sorts of methods that involve mapping impact vs. ease of implementation, etc, etc. Each can be useful in different situations and it’s all about using the right tool for the job. As my daydream/epiphany ended, I stood back up, grabbed the drill and drilled about 20 more holes in the door – lined up side by side – to effectively punch out the correct shape in the door. Switching drill bits to a high-speed masonry bit, I used the side of the drill as a makeshift router to smooth the rough edges of my hacked out hole. The whole process took a pretty long time. The end result was ok – the hole is the right shape and except for a few rough edges the project came out fine. Just like at work – you can solve a problem without the right tools – but it’s ugly, the results are mediocre, and it takes a lot longer than if you’re properly equipped.